"Engraved double-hemisphere map in outline color. Relief shown pictorially. Shows routes of Magellan, Dampier, Tasman, le Maire, Gaetan, Olivier, Dudley, Medana, Gallegos and Schouten. De L'Isle is important as the first ""scientific"" cartographer who incorporated the most current information on exploration and topography into his maps. His maps of America contain many innovations: discarding the fallacy of California as an island, first naming of Texas, first correct delineation of the Mississippi Valley, and first correct longitudes of America. Lloyd Brown states that De L'Isle ""undertook a complete reform of a system of geography that had been in force since the second century, and by the time he was twenty five he had very nearly accomplished his purpose."" This copy is without title page, as issued. This is a relatively early edition of De L'Isle's untitled atlas, published in Paris, with most of the maps having the ""Quai de l'Horloge"" imprint. 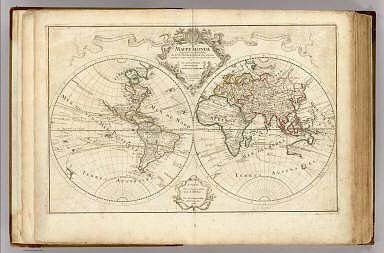 All of the important maps of the Americas are present: Hemisphere Occidental, 1st issue 1724; Carte d'Amerique, 1st issue, 2nd state 1722; L'Amerique Septentrionale, 2nd issue 1700-1708 ; L'Amerique Meridionale, 3rd issue 1700-1708; Carte du Canada, 2nd issue 1703-1708; Carte de la Louisiane, 1st issue, 2nd state with New Orleans 1718; Carte du Mexique et de la Floride, 2nd issue 1703-1708; Carte de l'Isle de Saint Dominque, 1st issue 1725; Carte des Antilles, 1st issue 1717; Carte de la Terre Ferme du Peru, du Brazil, 2nd issue 1703-1708; and Carte du Paraguay du Chili, 2nd issue 1703-1708. Only two of the ninety four maps were issued after De l'Isle's death in 1826: ""Carte du... Senegal... Ouvrage Posthume... Par... La Veuve Delisle 1826"" and ""Alexandri Magni Imperium...Opus Posthumum...1731."" Early Paris editions (ie before Buache became publisher in 1732) of De L'Isle's atlas with the full 94 maps are scarce - the LOC has none." Carte de la Babylonie nommée aujourd'hui Hierac-Arab avec les noms, tant anciens que modernes et les routes des expéditions de Cyrus et de Julien l'Apostat, aussi bien que celles de Teixera, Benjamin et autres voyageurs modernes [Document cartographique] / ouvrage posthume de Guillaume de l'Isle ; publ. par Joseph Nicolas de l'Isle,... ; Goulet l'Ainé, inv. et sculp.